Q. 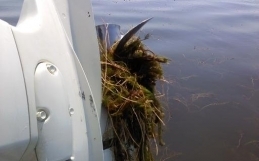 Will aquatic plant controls eliminate all aquatic vegetation? A. NO! Nearly all currently available aquatic plants controls are SELECTIVE (i.e., they control some plants but not others). 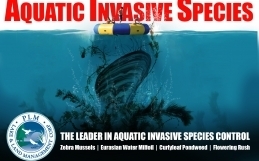 Intelligent aquatic plant management uses this selectivity to remove particularly problematic plants while leaving others unaffected. This approach minimizes interference with recreation while leaving desirable vegetation that provide BENEFITS to the lake (see below). Harvesting cuts all plants in the affected area, but plants are not killed and will regrow. Intelligent aquatic plant management removes the most problematic aquatic plants, which are typically exotic species, while preserving desirable native vegetation. Q. Can’t we get rid of ALL the weeds in our lake? Q. Are aquatic herbicides safe? A. YES! Extensive testing has not identified significant human health risks associated with the proper use of these herbicides. And though no testing program can absolutely rule out unexpected effects, it is important to recognize that we daily use many materials that are known to be toxic, carcinogenic, or otherwise harmful – materials that have been identified as health risks by the same sort of testing to which aquatic herbicides are subjected. Gasoline, for example, contains a number of potent carcinogens, to which we are exposed every time we fill a gas tank. Q. We don’t want to use CHEMICALS in our lake… isn’t harvesting a more environmentally responsible aquatic plant control technique? A. Not necessarily. The most environmentally responsible control technique depends on the goals of the management program and the type(s) of plants to be controlled. In some cases, harvesting is the best choice. In other cases, harvesting can exacerbate aquatic plant problems. For example, we would not recommend harvesting a lake with an uncontrolled Eurasian watermilfoil population because harvesting will speed the spread of this aggressive exotic plant and hasten the replacement of native plants. Q. Why do you keep telling us not to eliminate all the weeds from our lake? A. Aquatic plants provide many benefits to a lake. Aquatic plants stabilize sediments, which promotes greater water clarity, they help oxygenate the water, and they provide valuable cover and habitat for fish and other organisms (many of which are important fish-food). Trying to completely eliminate aquatic plants from a lake that has good conditions for plant growth is a frustrating, expensive and counterproductive management approach. It may succeed for while, but in the long run it will lead to increasing problems, as the lake accumulates the toughest, hardest-to-control weeds and algae. Fighting nature this way is also DRAMATICALLY more expensive than reducing problem species while encouraging the growth of less troublesome plants. Q. Our lake has been receiving algae treatments, but the water is still green… why haven’t the treatments made it clear? A. In lakes, algae treatments are usually intended to remove filamentous algae (i.e., mats of threadlike algae that grow on the bottom or floating at the surface). Algae treatments to lakes do not control planktonic algae (i.e., the microscopic algae that are too small to see and give the water an overall green color). Planktonic algae control would require treating the entire lake, which is rarely feasible in larger bodies of water (it often is feasible in ponds). Controlling planktonic algae problems in lakes usually requires controlling the sources of nutrients that fertilize their growth. Q. Aquatic plant control just addresses the SYMPTOMS of the problem—shouldn’t we be addressing the CAUSES of the problems, such as nutrient enrichment? A. Yes, BUT… This statement is a confusing half-truth. There is little doubt that nutrient enrichment leads to conditions that support lots of plant growth; however, this doesn’t mean that you can reverse the process and prevent rooted plant growth. Nutrient controls have been successfully used to reduce the growth of planktonic algae, but there has never been a case where nutrient controls have reduced an existing rooted plant problem. In fact, reductions in planktonic algae typically result in an INCREASE in rooted plant growth, as the water becomes clearer and plants can grow at greater depths. In addition, exotic plant species cause the greatest problems in lakes. These exotic plants are a CAUSE of many problems, and removing them is addressing one of the causes of lake problems. Nutrient controls can be an important PREVENTATIVE measure, which can help to keep the lake from developing worse problems in the future. For answers to further questions, please contact your local PLM Division.